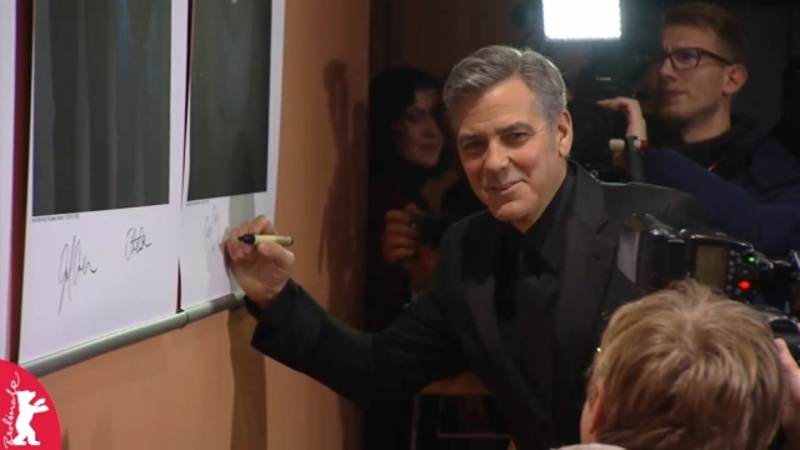 George in all black suit and tie nice. Photos on Getty everyone. They look amazing! Mailonline have the all the Getty pix - and more! Thanks Vilma. I wonder if Nicky80 went in the end? 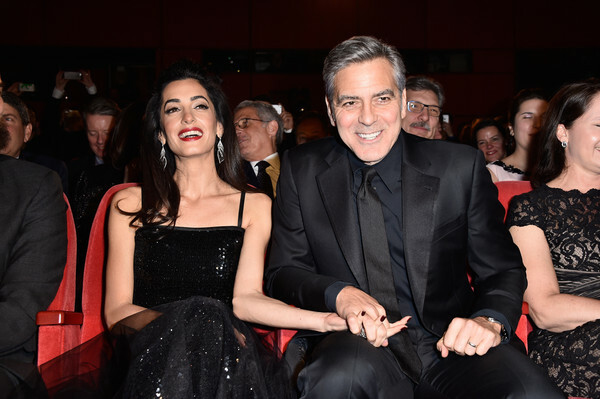 She attended to support her husband and his brand-new release but Amal Clooney unintentionally stole the spotlight from leading Hail, Caesar! 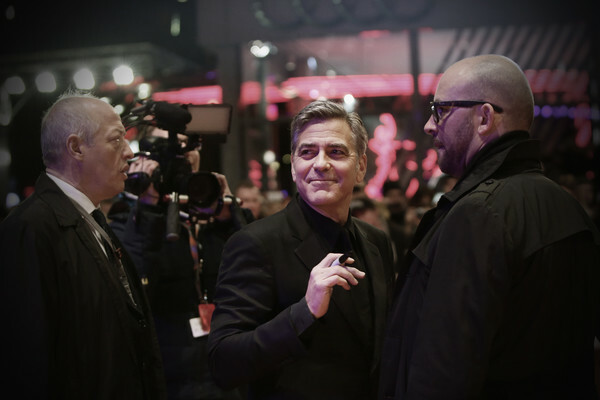 star and husband George as the couple led the glamour at the opening ceremony of Berlin Film Festival on Thursday. 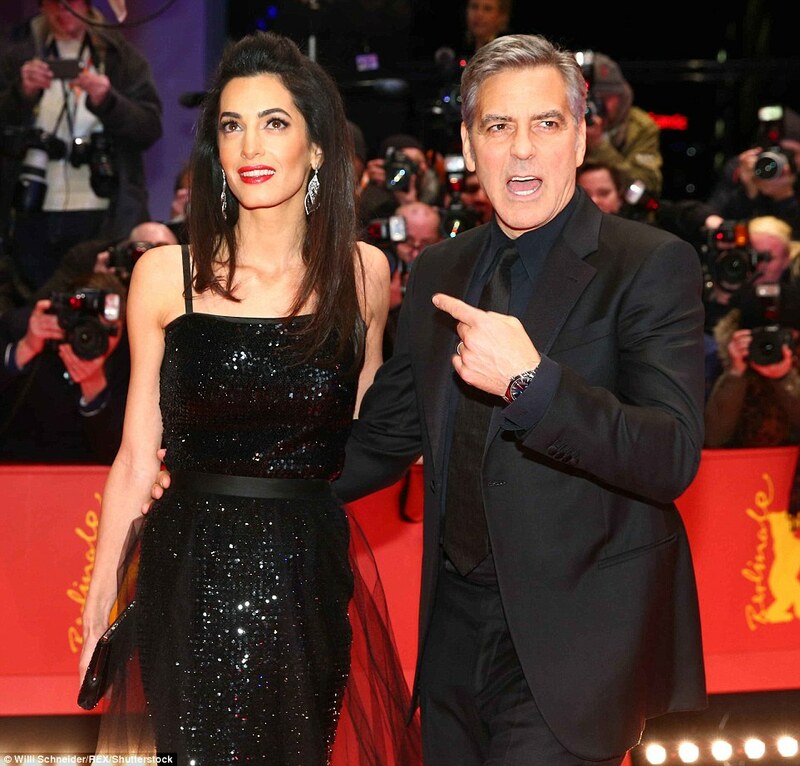 Amal, 38, commanded the limelight as she sparkled in a black sequin ball gown, which was the perfect choice for her slim and statuesque figure, ahead of the premiere of 54-year-old George's hotly-anticipated comedy. 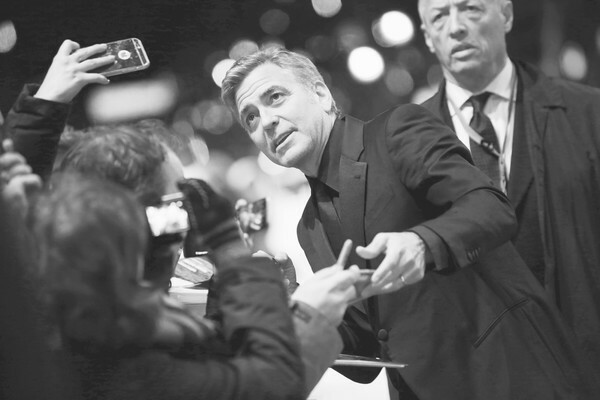 The Lebanon-born lawyer was a vision of elegance as she worked her magic on the red carpet ahead of the ceremony which opened the 66th annual industry event in the German capital. Amal was a sight to behold as she captivated the crowds, twirling around in her show-stopping dress fit for a Hollywood legend's wife. The dazzling one-piece featured a column-style dress - rendered in small black sequins - which featured two spaghetti straps and clung to every contour of her towering figure. The creation also featured a delicate waistband which drew attention to her narrow middle while a full circle skirt - which was A-line in style and swept the floor - was the main talking point. Amal transformed into a real-life princess for her evening spent socialising with film-industry royalty, including Tilda Swinton and Meryl Streep. And you can still watch the live stream from the opening gala. I took Screenshots too, but they are the worst screenshots in the world, Next time I criticize a paparazzi someone stop me plz. They look great , I love the gown. 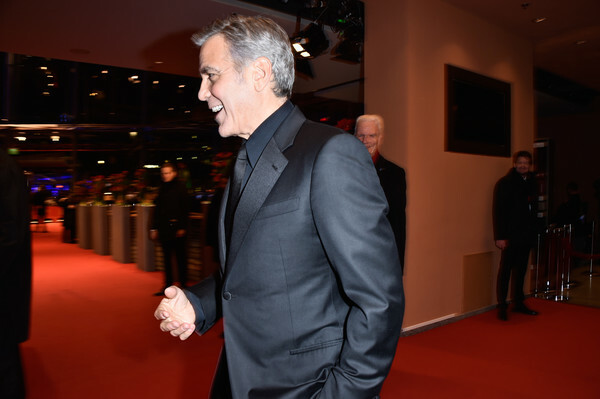 Amal Clooney turned heads with a look fit for a princess at the premiere for husband George Clooney's latest film, Hail, Caesar!, at the 2016 Berlin International Film Festival Thursday. The 38-year-old international law and human rights attorney walked the red carpet with the actor while wearing a sparkling A-line black gown with a sheer and ruffled skirt and spaghetti straps. She paired the look with black pumps and a matching clutch and bold red lipstick. 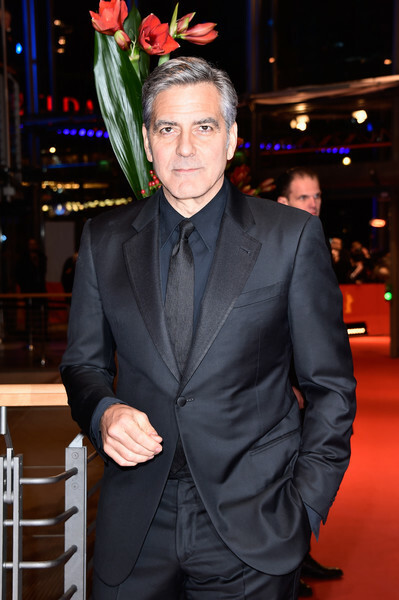 George, 54, looked as dashing as ever in an all-black tux. The couple arrived in Germany on Wednesday. The night before, they were spotted getting cozy during a dinner date at a sushi restaurant in Los Angeles. 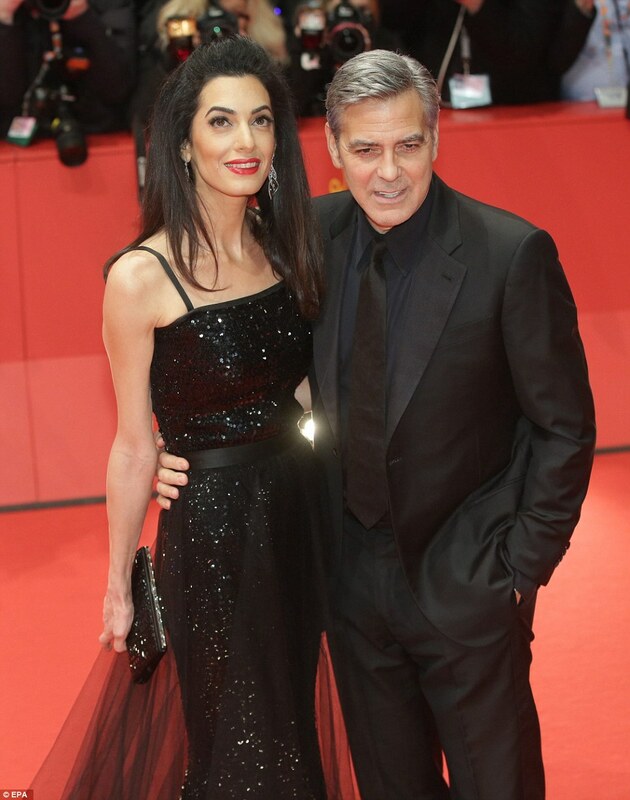 Amal has showcased a number of stylish looks on and off the red carpet since she and she and George wed in Italy in September 2014 in front of family and friends. Hail, Caesar! is a comedy directed, written and produced by Joel Coen and Ethan Coen. The movie is set in 1951. Josh Brolin plays a film studio executive who moonlights as a "fixer" who works to keep stars' scandalous behavior under wraps. 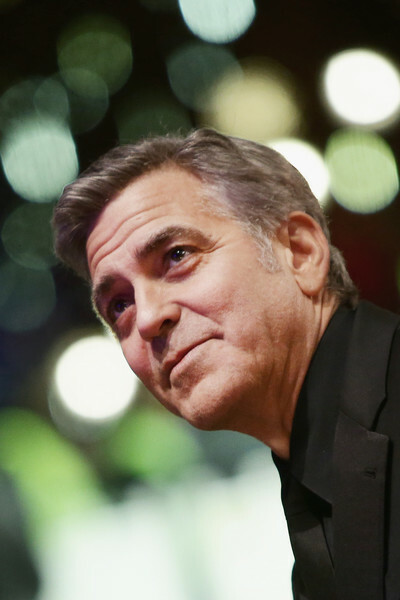 Clooney plays an actor who is abducted by Communists and begins to sympathize with their cause. Hail, Caesar! 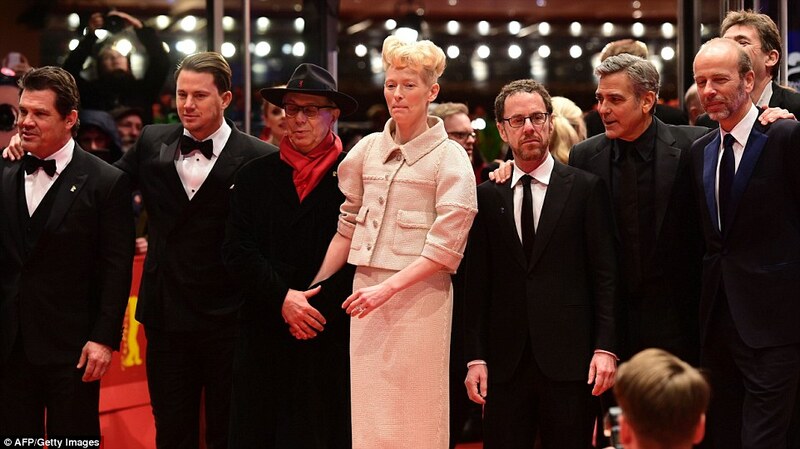 also stars Ralph Fiennes, Scarlett Johansson, Channing Tatum, Jonah Hill and Frances McDormand. 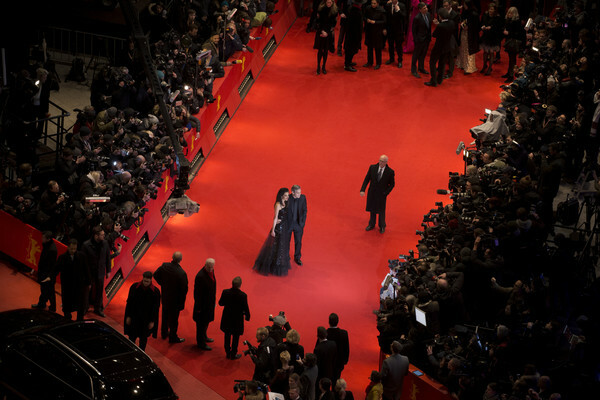 The film was released in the United States last week and will hit theaters around Germany and other parts of Europe next week. 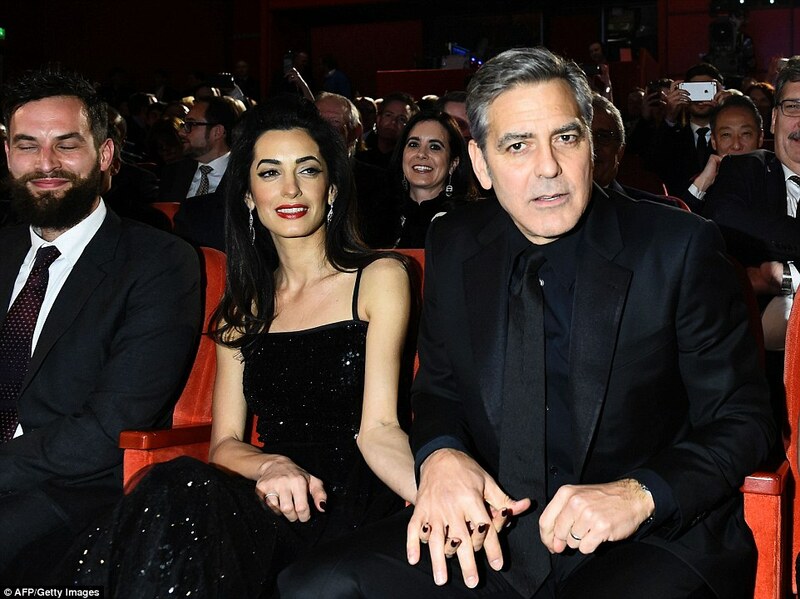 George and Amal are once again doing the "gazing look of love" for the cameras ( IMO has grown so stale it's not even believible anymore- but I digress) and Stan is to the left of the photo, looking as if he's holding his nose. Yes, that one made me laugh too. 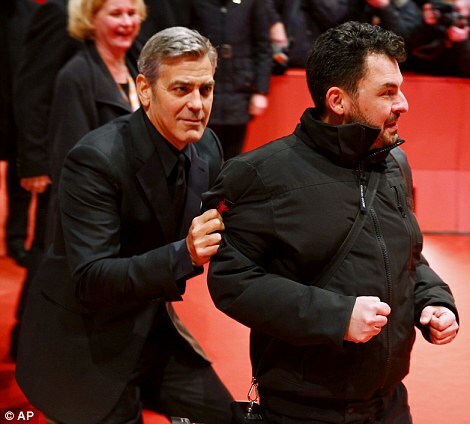 Perhaps this is Stan's way of secretly signalling to George to cut it out? We can but hope! 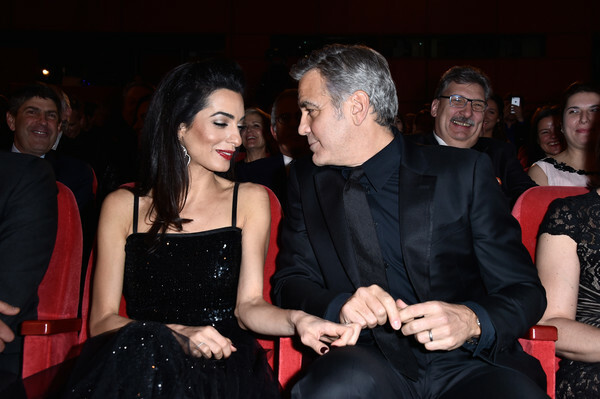 If you watch video of them they aren't just standing there gazing at each other George is actually talking to Amal andthe paps take the shot. I've seen it in all their videos it looks like a long gaze but nope. Ok, I'm dumb! Where's the video? The dress in question was hand-picked by the star and is by Yves Saint Laurent, amde back in 1981. Amal exposed a generous proportion of her décolletage and slender arms thanks to the open nature of the top of the dress. She didn't scrimp on glitz when it came to her jewellery and she sported a pair of statement diamond earrings which were two-tier in design. She carried a small black leather purse-clutch bag and ensured not to distract from the foundation of her look by picking out a pair of black patent leather heeled courts which further lifted her 5' 6" frame. Amal impeccably made up with professionally-applied contouring and highlighter intensifying her striking facial features while eyeliner flicks widened her bold brown eyes. She added an extra glamorous touch to her sensational ensemble by opting for a fail-safe lipstick colour - bold but glossy red. 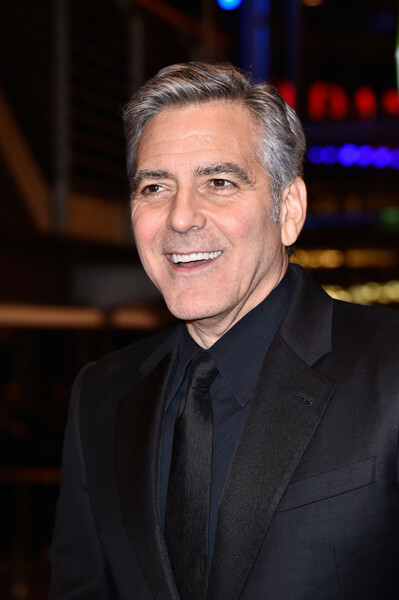 Meanwhile, George was suitably suave in a two-piece black suit which was comparably low-key to his wife's dazzling sartorial display. He followed her lead, opting for an all-black colour theme with a pair of freshly-shone leather brogue shoes offering a contrasting edge. 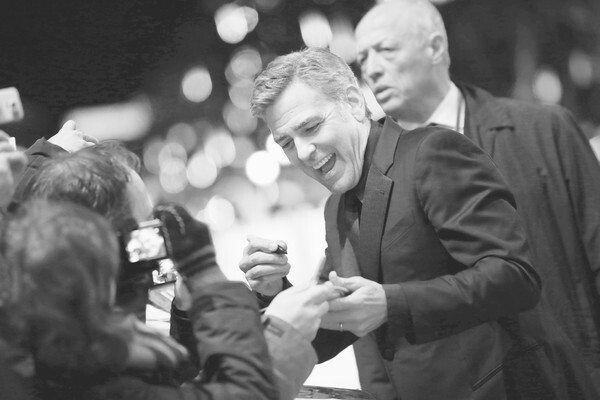 George - who plays Baird Whitlock in the upcoming American comedy - seemed in high spirits as he put on a tender display with his wife, caught up with his co-stars and played up to the pap-pack by larking around. 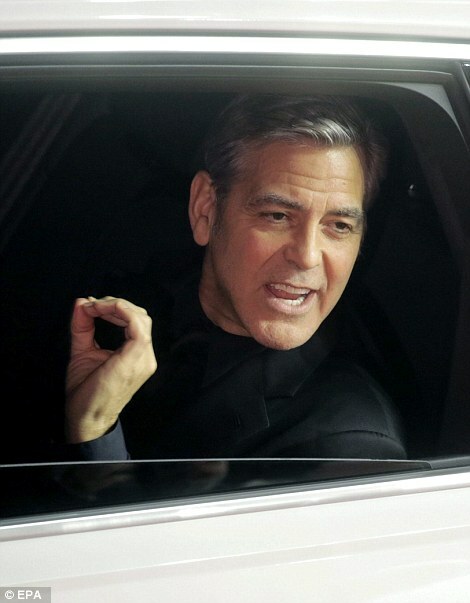 George had clearly cheered up following his awkward interaction with a Mexican journalist at the film's press conference earlier in the day. 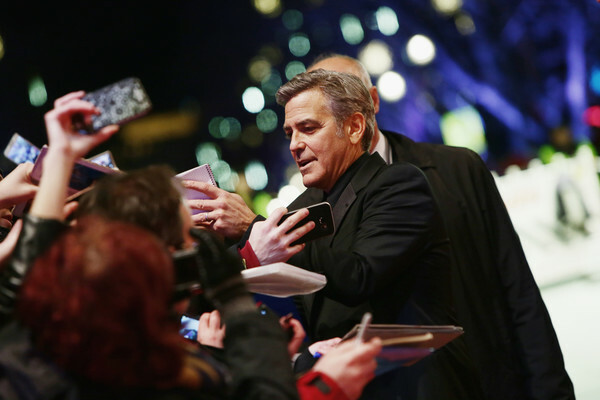 He lost his temper with a reporter as he was quizzed about what he was personally doing to help the European refugee crisis during the conversation with the media and his fellow Hail, Caesar! stars. 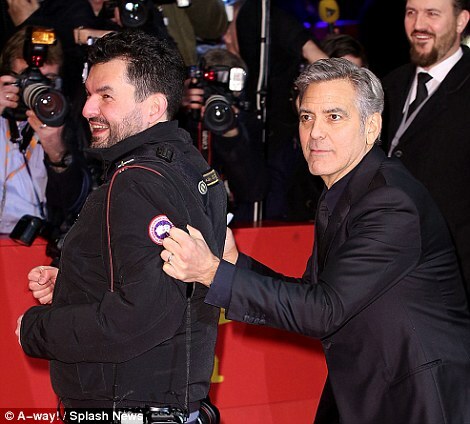 The Hollywood heavy-weight shot down the journalist with a defiant response when asked what else he was doing, aside from making multi-million pound movies, to ease the ongoing emergency. 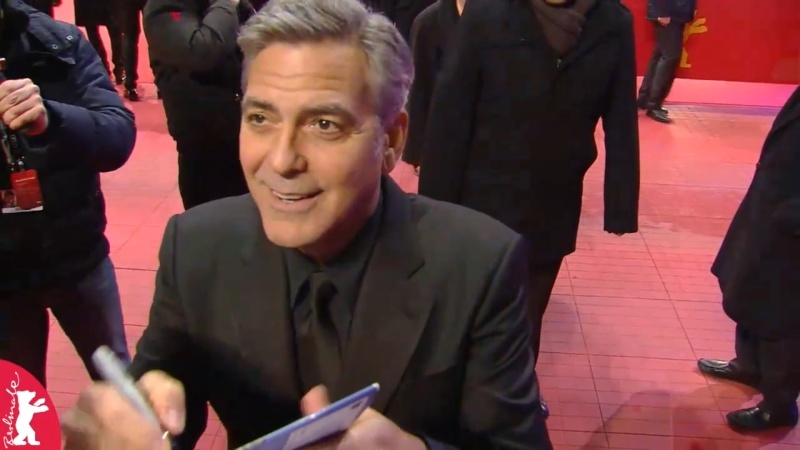 I think today's young stars should take notes from George he just works the carpet no star attitude. too bad Amal doesn't!! just my opinion, folks. 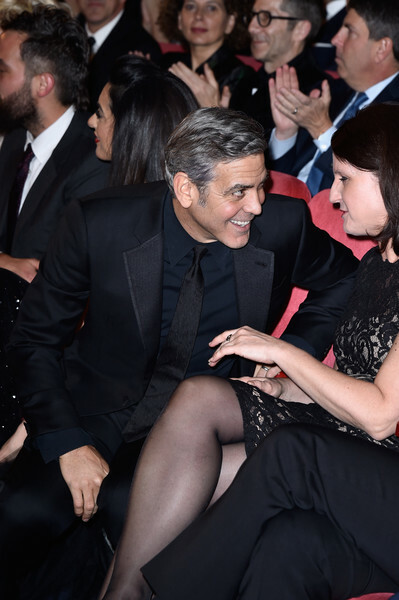 Yes they look like they are having a good time, and George is trying to stay off the dress. George stepped on the dress several times. 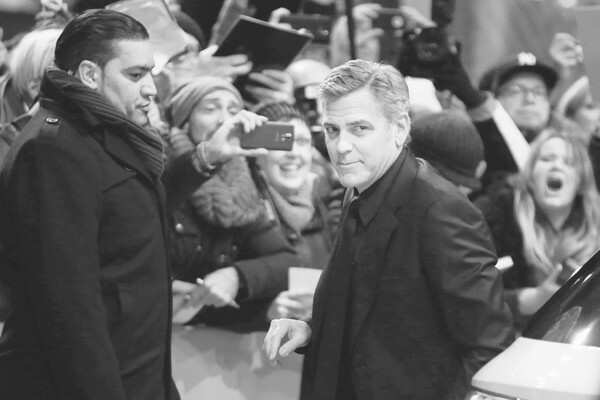 It was really nice to see again how much time George spent with the fans. PigPen wrote: too bad Amal doesn't!! just my opinion, folks. Really? She's not in the film. Should folks ask for autographs from her? That would really be attention seeking in my book. Thank you Katie great pictures. 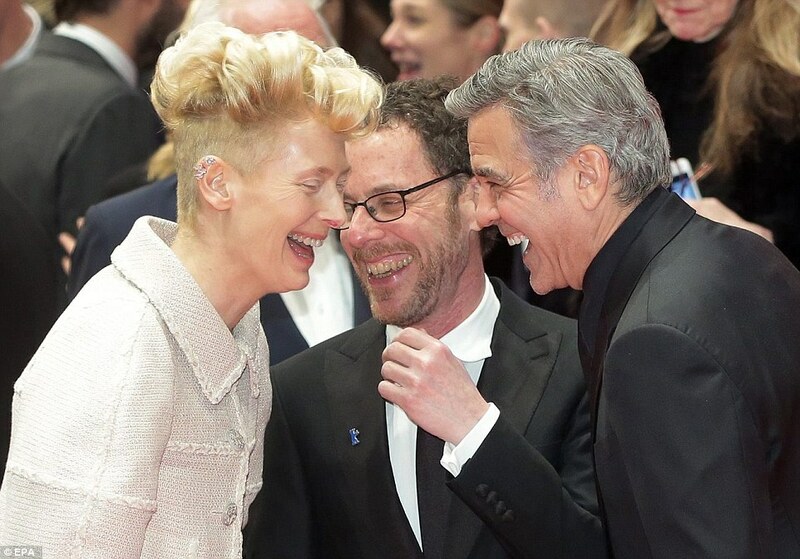 Wow what a lovely ClooneyFest. 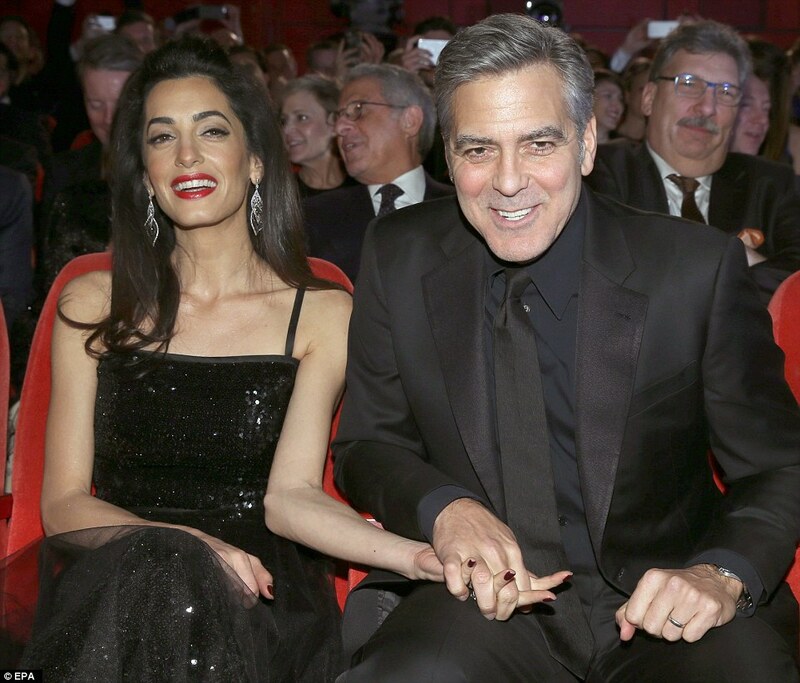 of Amal & George & Gio ! Lovely to see a glamorous outing on the red carpet. Seems ages since such a gathering. Thank you for all the photos !!!!!!!!!! 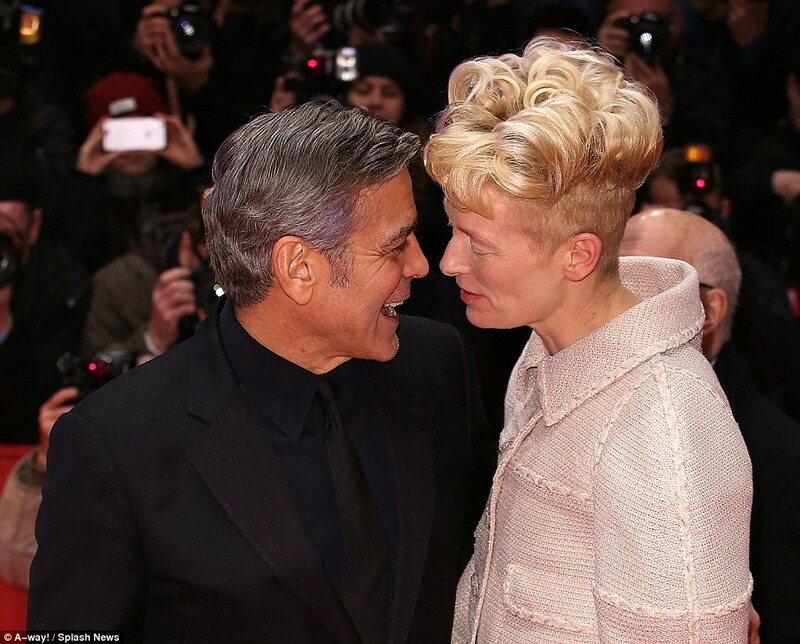 PAN -Isn't that second tweet the same "look of love" pose he did earlier with Amal? Is he cheating already??!!! PS- Did you get a look at Tilda's shoes? WOW! Now there's a lady with her own sense of style! Thanks everyone for the amazing pictures. 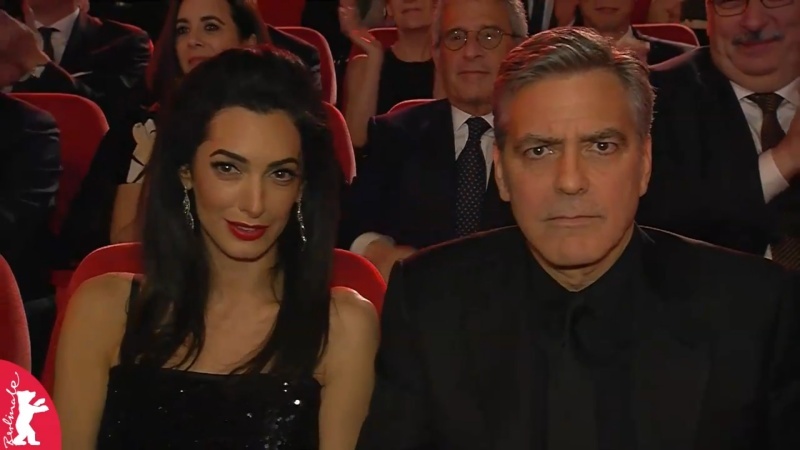 George and Amal look fantastic! I love George's suit. It fits him perfectly and he looks impeccable. Amal's dress is gorgeous. She looks stunning. 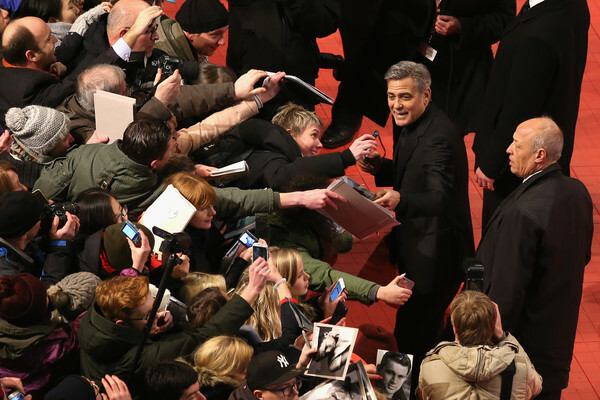 No one works a red carpet like George. Lol yes every gown has had the George feet test . 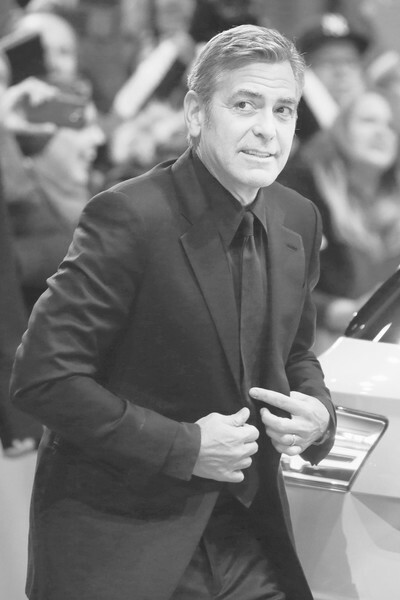 I love love love George in the dark monochrome suit. That's one of his best signature looks. Yum. I liked her dress and shoes. Saw George step on her dress several times. 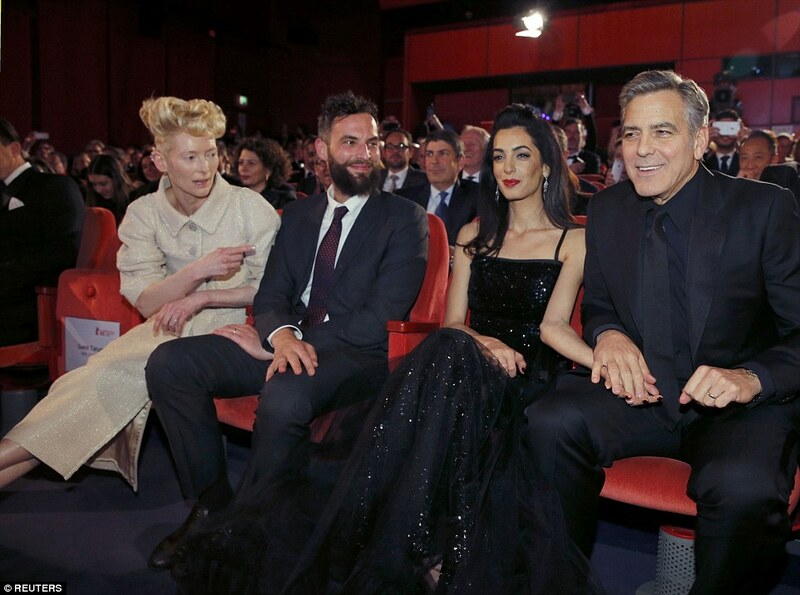 He wanted Amal to have her moment, had to laugh to myself because he did the same for Stacy when she wore that gold dress (she got her moment too). One can only hope that Amal doesn't catch pneumonia after this trip. I guess that is the price of "showing the fashion": you have to grin and bear the elements when others can dress appropriately for the weather (i.e., an overcoat). It's good to see that she dressed for the cold temps on Friday. Surprisingly, she is also wearing sensible shoes. 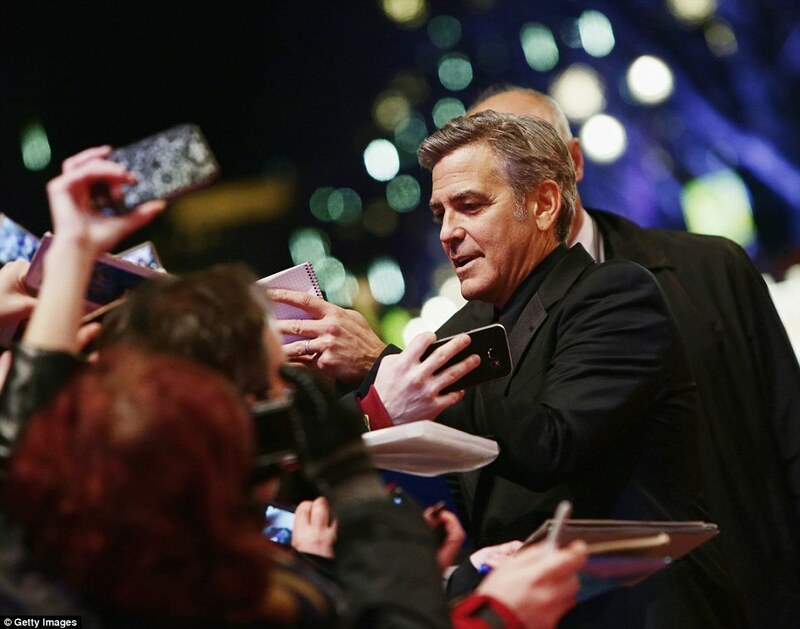 annemarie wrote: I think today's young stars should take notes from George he just works the carpet no star attitude. Alright, I've got to ask: what on earth did she do wrong? 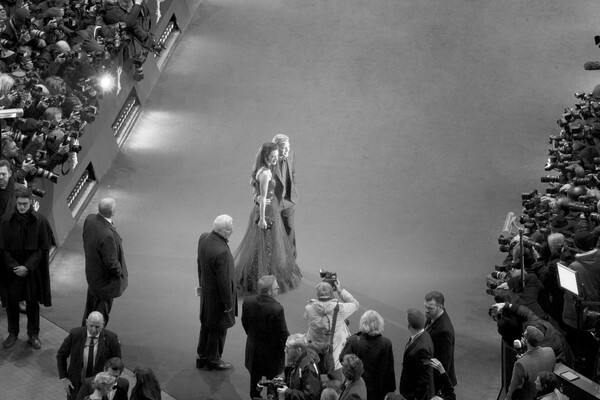 As far as I can see, she turned up, wore a great dress, didn't do any weird makeup, hairstyle or accessories; stood next to her husband and smiled for the cameas as requested and then left him to walk the red carpet and do the fan stuff by himself. If that isn't the definition of perfect behaviour, what is? Katiedot, what on earth did she do wrong? She had the audacity to marry George. Just my opinion. Katiedot wrote: Thanks Vilma. I wonder if Nicky80 went in the end? Well yes after work but i wasn't that lucky like 2 years ago. 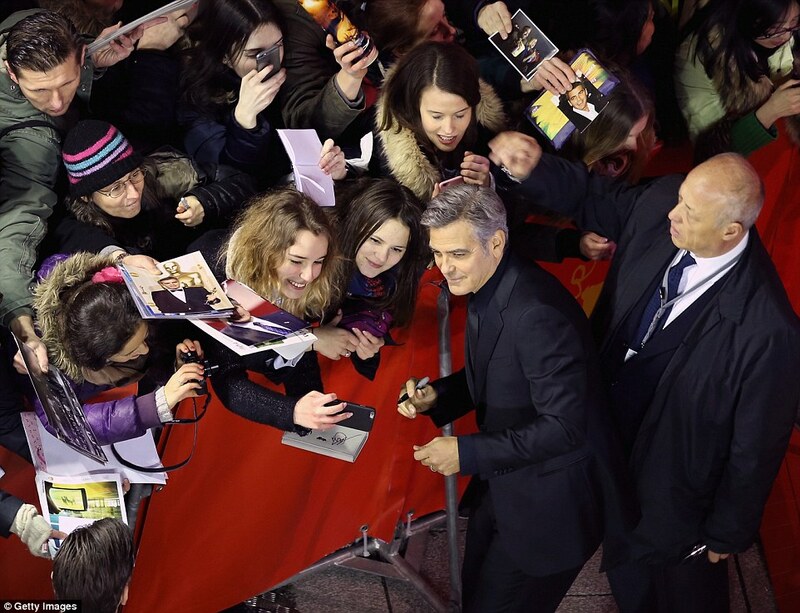 It was really packed with million Maryl Streep fans and had fan banners everywhere. I didn't know she had so many fans here and I'm still not sure if this was an organised fan club or not. I had no chance to got to the front this time. But when he came he pulled down the window from the care when he drove up the drive way so everyone could see him first. 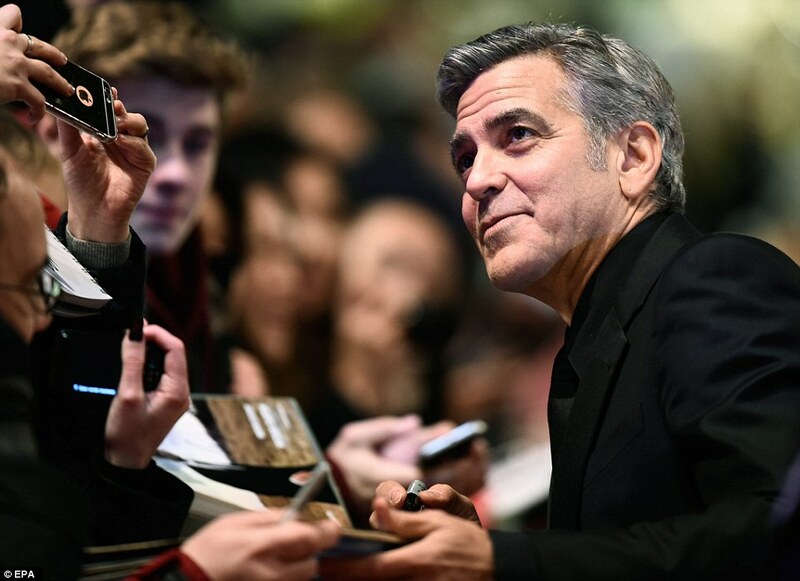 So cool When he got out he went straight to Amals side and made pics with the press after Amal waited inside and George came back to sign autographs. 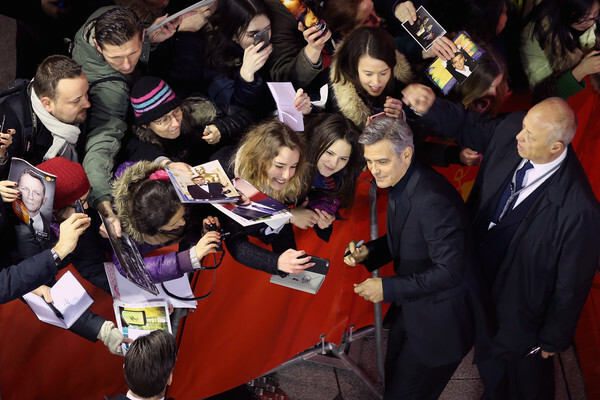 Everyone thought he doesn't come back as last time he gave autographs first but i guess he didn't wanted to let Amal wait in the cold so he did the picture thing first and then the autographs. Ah next time I will take off again to get a chance to be in the front row again. I felt a bit sad this time not to be lucky but I know I can't have everything. I think it's great that you went and tried. You will have more luck next time! Oh wow! Ok, not quite so awesome this time, but I think it's really great that you went. Pan what happens on Wednesday in Glasgow? I have black out.